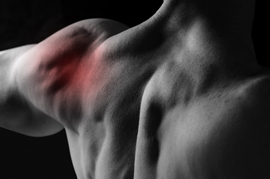 Dr. McCluskey can help relieve frozen shoulder and shoulder pain. Shoulder joint is one of the most mobile joint that is virtually used in all major muscular and functional activities across upper limb. Frozen shoulder (also known as adhesive capsulitis in scientific terms) is a condition that causes significant pain, discomfort and stiffness in shoulder joint that may compromise all the activities mediated by upper limbs. Data and statistics indicate that the prevalence of frozen shoulder in general population is 2% with majority of the cases reported in individuals between the age of 40 and 60 years. Besides physiological aging, certain medical and vascular health issues can also contribute to the pathogenesis of frozen shoulder syndrome. According to a published report in peer reviewed scientific journal “Scandinavian journal of Rheumatology”, author B. Reeves (1) suggested that the pathogenesis of frozen shoulder can be divided into 3 major stages. Painful stage that marks the beginning of shoulder pain and discomfort (with moderate disability). You can take care of normal daily activities but with significant pain. Adhesive capsulitis or frozen shoulder syndrome is caused by ongoing process of inflammation that affect the integrity of shoulder capsule in the beginning; however, if left untreated, it may involve all associated joint structures like muscles, tendons, ligaments and tissues to cause pain, discomfort and limited range of motion. Chronic untreated inflammatory lesions ultimately lead to thickening of joint components to cause stiffness and long term disability. Diabetes is one of the most significant risk factor and according to clinical data, the risk of developing frozen shoulder is 71% higher in diabetics when compared to non-diabetics. According to another study conducted by Pal (3), 19% of all diabetics develop frozen shoulder syndrome at some point of their life. Endocrinological or certain metabolic conditions like tuberculosis, hyper-secretion or hypo-secretion of thyroid hormone, Cushing syndrome and other endocrine ailments can affect the health of joint components. Advancing age increases the risk of degenerative bone disorders that further impedes normal circulation and remodeling of bones to limit inflammatory damage. What are some of the most reliable treatment options for Frozen shoulder syndrome? According to the report published in International orthopaedics, author Sharma (4) suggested that the treatment options for the management of frozen shoulder syndrome are numerous and the quality and efficacy of results vary with the age, gender and lifestyle of patients. One of the most effective holistic methods of treating frozen shoulder is chiropractic. How can chiropractic care helps in managing frozen shoulder syndrome? It can be excruciating trying to brush your teeth or combing your hair when your shoulder “locks” in place leaving you helpless. Chiropractic adjustments help in improving the range of motion across the shoulder joint by thoracic and cervical manipulation. Francis X. Murphy (7) conducted an extensive study on 50 patients (in the age range of 40 to 70 years). All the patients were advised one chiropractic procedure for a period of 4 months and results were dramatic. 32% patients reported 100% resolution of pain symptoms, stiffness and restoration of complete range of motion across shoulder joint. And 2% (or 1 patient) reported 50% improvement. Chiropractic adjustments are helpful in improving the alignment of joint components to promote natural healing and early recovery. Most adjustments improve the range of motion to more than 90% within a period of 8 weeks. Some chiropractic adjustments may cause pain initially, but with improvements in the tension across joint, the symptoms of pain decreases significantly. Besides adjustments and chiropractic manipulations, chiropractors also advise lifestyle modifications and exercises to improve the range of motion, pain and discomfort and independent mobility of shoulder joint. Although chiropractic treatment may take months, but the results are free of complications or side effects. Speak to Dr. McCluskey to know more about the potential treatment options for your frozen shoulder syndrome. Reeves, B. (1975). The natural history of the frozen shoulder syndrome. Scandinavian journal of rheumatology, 4(4), 193-196. Sheridan, M.A. and J.A. Hannafin, Upper extremity: emphasis on frozen shoulder. Orthop Clin North Am, 2006. 37(4): p. 531-9. Pal, B., et al., Limitation of joint mobility and shoulder capsulitis in insulin- and non-insulin-dependent diabetes mellitus. Br J Rheumatol, 1986. 25(2): p. 147-51. Sharma, R. K., Bajekal, R. A., & Bhan, S. (1993). Frozen shoulder syndrome. International orthopaedics, 17(5), 275-278. Levine, W.N., et al., Nonoperative management of idiopathic adhesive capsulitis. J Shoulder Elbow Surg, 2007. 16(5): p. 569-73. Bruckner, F.E. and C.J. Nye, A prospective study of adhesive capsulitis of the shoulder (“frozen shoulder’) in a high risk population. Q J Med, 1981. 50(198): p. 191-204. Murphy, F. X., Hall, M. W., D’Amico, L., & Jensen, A. M. (2012). Chiropractic management of frozen shoulder syndrome using a novel technique: a retrospective case series of 50 patients. Journal of Chiropractic Medicine, 11(4), 267-272. Polkinghorn, B. S. (1995). Chiropractic treatment of frozen shoulder syndrome (adhesive capsulitis) utilizing mechanical force, manually assisted short lever adjusting procedures. Journal of manipulative and physiological therapeutics, 18(2), 105-115. McHardy, A., Hoskins, W., Pollard, H., Onley, R., & Windsham, R. (2008). Chiropractic treatment of upper extremity conditions: a systematic review. Journal of manipulative and physiological therapeutics, 31(2), 146-159.